There's no specific code that dictates where toilet paper holder placement should be in a bathroom, or which side of the toilet it should be on, for that matter. Where it's placed doesn't affect anyone's health (unless they're mobility impaired and need help); it's usually just a matter of space and convenience for everyone in the household. There are a number of ways that toilet paper can be made available and convenient in the bathroom. It can be placed on a stand, in a basket by the toilet, along the wall next to the toilet or along the vanity that's next to the toilet. There are some layout considerations when a bathroom is being designed and where the toilet is being placed. The toilet paper holder placement can be decided once the toilet and vanity placement have been determined. Most housing codes dictate that a toilet is usually 15 inches away from a wall on either side, but that isn't mandatory for smaller bathrooms. Some toilet paper holder placement is on the wall next to the toilet or on a movable stand. If the toilet is far from a bathroom wall, the toilet roll holder height is decided by the movable stand. There are many on the market that can be adjusted so the toilet roll holder height is convenient for a number of bathroom users. There's nothing more frustrating than not being able to reach toilet paper after using the bathroom. Toilets tend to be about 15 to 16 inches off the floor, so toilet paper holder height should be around that same. Toilet paper roll height shouldn't be too much lower than around 18 to 20 inches so it's easy to reach. The toilet paper holder height shouldn't be too high as well. 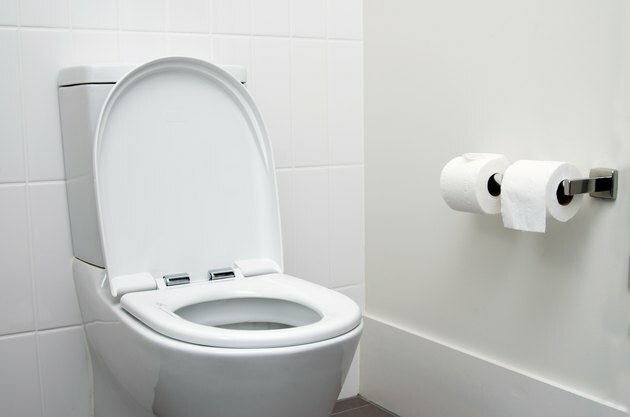 If the toilet is near a wall, the toilet roll holder height should be about a foot or less away from the toilet on either side and no less than 18 inches off the ground. Several online blogs suggest having the toilet paper holder height at around 23 to 26 inches off the ground. That's up to the homeowner's discretion, but those are the most convenient numbers compared to the average toilet height. In the case that other toilet paper roll placement ideas are needed, consider just having the loose roll sit on the sink next to the toilet. It can also be placed on the back of the toilet for users to reach around and grab at their own convenience. Or, it can simply be placed on the closed lid of the toilet.